Do you have secret dreams of dancing ballet, but aren’t sure where to start? I founded the Align Ballet Method in 2012. For the past 6 years, we have been providing high-quality ballet training to adults in the Los Angeles metro area. Our primary focus is working with beginner adult ballet students, many of whom have never attended a dance class before. This is a unique program, as most adult dance classes are geared towards more advanced students; it can be difficult to find dance training that is at just the right level for mixed groups of dancers. I’m proud to say that the Align Ballet Method has been doing that successfully in studios all across Los Angeles, gaining more students every year. At the beginning of 2017, our instructor Kiara informed us that she would be applying to the MFA Dance program at UC Irvine. This was great news! Of course, I was sad to think about losing her at Align Ballet, as she has been instrumental in the success of our LA classes, but I believe education is important and encouraged her to reach for a new horizon. I was pleased to hear that not only did Kiara get accepted to the master program — she received a full scholarship! Orange County Align Ballet Method instructor Kiara. Once she confirmed she would be moving to Orange County, I immediately explored the idea of launching our classes in Orange County. We’ve considered it before, but now it looked like a very real possibility, as one of our most experienced and popular instructors would be in the area. We spent a few weeks contacting studios and received a positive response from Odyssey Dance Studio in Newport Beach. You see, the Align formula has been to serve people in their neighborhoods; instead of having one studio, we partner and sublease space in existing dance studios across LA. Most of these studios specialize in working with younger dancers. Most children ballet students are leaving a studio around 6:30 PM or 7 PM at the latest, so that is when we usually schedule our weeknight classes (and these are great times for working adults). When I went to Odyssey to meet with the owner Emily, I was immediately impressed with the space. The studio was large with a beautiful sprung floor and high ceilings. Emily had been a former student with the studio and she just recently purchased the business, so we were both excited to see the mutual opportunity in starting a few Align workshop classes there. 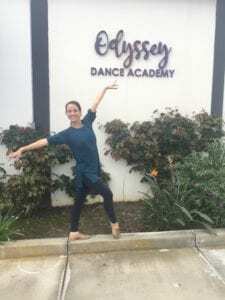 Align instrurctor Kiara at Odyssey Dance Studio. We began our first workshop in September of 2018 at Odyssey with only 6 students. This was a small class for us, but we’re just getting started. We have a long-term approach for our Orange County adult ballet program. We know from our previous research that Orange County has many dance studios, but not many have a class specifically for adult beginners. We believe there must be an equal demand for adult ballet in Orange County as there is in Los Angeles, so we are determined to stay focused and expand the OC program. So what exactly is The Align Ballet Method and how does it work? Align Ballet Method adult ballet students. We specialize in adult ballet and our Align 1 adult ballet beginner workshop will help anyone master the fundamentals of a basic authentic ballet barre. These barre exercises are the primary building blocks to learning the art of ballet. We use the phrase “authentic ballet barre” so that our classes are not confused with the current wave of exercise “barre” classes. An authentic ballet barre is vastly different from your typical “barre” class. In our classes, we perform all the exercises used across the world by major ballet companies. Our students will learn all the movements, positions, and terminology. Align has 3 levels of beginner workshops (Align 1, Align 2, and Align 3), and our goal is to develop students to the point where they may attend our open classes (Align 4+) and make ballet a part of their lifestyle. By the completion of our Align 3 workshop, students can perform a basic ballet barre and center routine. Our process is both streamlined and thorough, and has been fine-tuned by working with thousands of adult ballet dancers over many years. An Align Ballet Method adult pointe students. The Align Ballet Method has had success helping adult students go from complete beginner to pointe shoes in around 6 months! Some of our adult students that began with us years ago now dance at a semi-professional level, and we regularly organize special programs to teach them to perform solos from the classical repertoire. I can guarantee you that we love what we do and our results are highly satisfying to our students. We are 100% dedicated to making your dream of studying ballet a reality. If you live in Orange County and are interested in ballet, leave a comment or share this post! We’d love to hear from you. REGISTER for an Orange Country workshop. We’ll see you at the barre!